Once one of the hardest working artists in the music industry, prior to his career being put on hold due to incarceration, Sky Balla and his team had created a substantial buzz and all signs pointed up. Known for his flashy and flamboyant yet gritty rhymes about the hustler lifestyle and his vigorous networking tactics, he built solid relationships with some of the real power players both in and outside of the studio. He proved to truly understand being the definition of a hustler. But no stranger to backing up his rhymes in the streets, his lifestyle caught up with him in 2008 and he has been in prison since. This has not deterred him however, as he is hungrier than ever to get back on his musical grind and regain his momentum. Until then, he’s gearing up to release a new album September 4th. Musically Sky got his start in the heart of the Bay Area's mid 90's Mobb era under the tutelage of JT The Bigga Figga and San Quinn as a member of the group Tha Gamblaz. This included a Gold plaque for his appearance on Master P’s “West Coast Bad Boyz II” compilation and the San Francisco native is now known for his star studded collaborations with the likes of Fabolous, Game, Juelz Santana & Jim Jones of Dipset, N.O.R.E, Cassidy, E-40, Capone, Slick Pulla of USDA, Hell Rell, 2Eleven of CTE, Bleu Davinci, the late Mac Dre (R.I.P. ), Stack Bundles (R.I.P.) and many others. He's also worked with some of the industry's top producers including Scott Storch, Hi-Tek, Shawty Red, Focus, Tone Capone, Amadeus, Ron Browz, Nick Fury, Raw Smoov, Cozmo, Nu Jerzey Devil & more. As he branched out from his Bay Area roots and networked his way across the country, he was closely affiliated and worked heavily with both Dipset and G Unit, having Sha Money XL and Jim Jones both co-sign him on his “Mobb Report” album released in 2005. He was so close with the members of Dipset while living in New York; some thought at one time that he was a member of the crew. One would only need to take a look inside his “Mobb Report” album or look online to see visuals of the kind of networking Sky has done, via pictures of him with the likes of Jay-Z, Snoop Dogg, 50 Cent, Young Jeezy, boxer Floyd Mayweather Jr., Paris Hilton, DMX, Keyshia Cole, Fabolous, Lil Kim, Eve, Ice-T, NBA All-Star Allen Iverson, actress Eva Mendez, Game, Twista, Bun B, Swizz Beats, G Unit & lots of others. When mixtapes exploded on to the industry, Sky Balla was as active as anybody, taking cues from his NY brethren and learning the ropes while living there, he released several tapes of his own, hosting others and networking with top DJs around the world. He appeared on mixtapes from or released tapes with the likes of G Unit’s DJ Whoo Kid, Tapemasters Inc., Sickamore, Nu Jerzey Devil, Big Mike, September 7th, J. Armz, DJ Woogie, DJ Haze, DJ Rah2K, DJ Delz, DJ Wizkid, Digital Product and many more. His album released prior to his incarceration, 2008’s “Tycoon Status” sold an impressive 5,000+ units even though as he put it in a letter written from behind bars “I was locked up 3 days before the release of my last album ‘Tycoon Status’. I was not able to promote it or market it the way I would have liked to. It still managed to sell 5,000 plus Soundscan CD's, which is better than some artists who had the whole year to promote”. This is a testament to the relentless work Sky Balla and his team were putting in and the buzz he had created throughout the industry. The lead single from the album, “Posted At Da Bar” featuring Cassidy and Willie Henn was even played on the biggest Hip-Hop radio station in the country, New York’s Hot 97; and the 2nd single “Mobbin’ All Day” featuring E-40 and San Quinn received strong play on the Bay Area’s 106 KMEL. Sky was also featured on the cover of and had an in depth interview in Ozone Magazine for this release as well. What most people don’t know as well is Sky was in the process of negotiating a major label record deal with the late Shakir Stewart just prior to his passing. 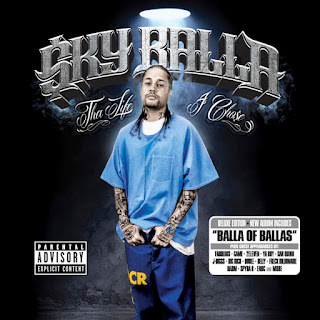 As he eagerly anticipates a late 2012 release from prison, Sky Balla will release a new album of unreleased material. The new project appropriately titled "Tha Life I Cho$e" will drop via Endless Hustle Entertainment through Empire Distribution and includes feature guest appearances from Fabolous, Game, 2Eleven of Young Jeezy’s CTE, Konvict Muzik artist Ya Boy a.k.a. YB The Rockstar, San Quinn, J-Diggs, Freck Billionaire, Big Rich, Belly, Dubee a.k.a. Sugawolf, Harm, Spyda D and Enoc. Production is handled by Dr. Dre protégé Focus, J-Money, Cozmo, Young Yonny, Tone Capone, Ron Browz, Matheo, Maxwel Smart, Priceless and Trackaddict. With tracks like "Balla Of Ballas", "I Got Money" featuring Ya Boy, “Keep On Talking” featuring 2Eleven and “Yo Ma” sure to be stand outs, "Tha Life I Cho$e" shows no signs of sounding dated or out of touch with the times, even with Sky Balla missing from the music scene for several years. In fact listening to this album, Sky was talking about what artists are talking about now, back then. If anything, he is ahead of his time. The album fits in perfectly with the flashy yet grimy trap music still being released every day. Hustlers worldwide, money counters and overtime grinders this is a soundtrack for you. The Deluxe Edition release will be available for purchase September 4th, 2012 on iTunes, Amazon and all other digital stores and includes 24 total tracks. Scheduled to touch down soon Sky Balla is highly motivated and eagerly anticipating his opportunity to hit the ground running to regain his spot in not only the music industry but in society. He has been plotting his return constantly, reaching out to producers and artists, still keeping his networking skills sharp and his name buzzing. And he’s got a countless amount of songs written and ready to go. Until he is back on the streets Sky has a few words and a gift for his loyal supporters, “I wanna thank everyone who played a role in keeping my music lit and my name ringing”. In an effort to reach out to his fans and also to keep himself relevant while he is away, Sky Balla is giving away Free Downloads of his 1st three albums, “Mobb Report”, “Tycoon Status” and “Confe$$ion$ Of A Ballaholic”. Keep up with everything Sky Balla online, Download the Free Album giveaways and get the latest directly from him by following him on Twitter www.twitter.com/TheRealSkyBalla and adding his page on Facebook www.facebook.com/TheRealSkyBalla. For media inquiries and more information regarding the Sky Balla "Tha Life I Cho$e" album, please contact Craig Johnson a.k.a. C-4 of Endless Hustle Entertainment. He can be reached direct via phone at (925) 783-8150, email endlesshustle.entertainment@gmail.com, Facebook www.facebook.com/endlesshustle or Twitter www.twitter.com/ThisIsC4.